The topic of how much rehearsal time is necessary to work toward a performance is an interesting one to say the least. Music directors of all levels (middle school, high school, collegiate, and professional) would certainly agree we need all the time we can get. In addition, we all know that outside distractions can and do get in the way of effective rehearsals. There may even be wide differences of opinion between collegiate and school ensemble directors regarding the amount of time needed in rehearsal before a performance. When you feel the pressure of time due to shorter rehearsals or the performance that is just around the corner, one way to “normalize” things for you and your ensemble members is to stick to your musical skill building routines. This is extremely important for developing ensembles regardless of the level (public school or collegiate). Ten to twenty minutes of breathing, tone and balance building, rhythmic facility and articulation, scales, chorales, and tuning exercises reinforces the notion that these skills are important even if the performance is only one or two rehearsals away. Skipping this part of a rehearsal is not a recipe for success no matter what your rehearsal schedule is like (daily or otherwise). Think of this time as your musical “vitamins” – a daily routine! Getting into a habit of skipping these skills because you just don’t have the time should be a red flag warning for all developing ensemble directors. We all want our musicians to develop good habits of practice, posture, focus, rehearsal etiquette, etc. One of the best habits that we as directors provide for our ensembles is that of careful planning for each rehearsal. When we have a plan, and we stick to the plan, the students in the ensemble learn that the time that we spend together in rehearsal matters. Your students need to know that there is a plan for the rehearsal with specific goals in mind and desired outcomes for targeted learning. Take a brief moment to inform your ensemble of your goals for the musical skills or composition at hand at each rehearsal so that you maximize your time on task. Work toward achieving these goals and avoid getting side tracked with too many other musical details outside of your planned goals. As you wrap up your time on a composition, provide a few short comments regarding progress made and some thoughts about work to be done at the next rehearsal. Several years ago, I started keeping a rehearsal notebook (composition notebook) for each of my music ensembles with an outline for each rehearsal. My outline includes some items for the opening of rehearsal (long tones, articulation exercises, chorales, and tuning), a few goals and strategies for each composition that we are working on, the specific time frame for each activity or composition, and a few quick announcements for the end of rehearsal. If something comes up during rehearsal that I need to remember I quickly jot it down in my notebook so that I will remember. Even if my plans for a particular composition didn’t go exactly as I thought it might, after a few brief moments of reflection having my goals written down helps me to plan the next rehearsal. I have found that I am much better planned and organized for each rehearsal, and more efficient overall just by keeping this notebook. It has really been a game changer for me. When rehearsal happens less frequently there are no minutes that one can afford to waste. Personally, I do an adequate job of clock management given the goals that I have outlined in my rehearsal plan but it certainly isn’t perfect. Using a digital kitchen timer / clock has helped to keep me focused on my plan for the rehearsal. Sure, sometimes work on one component of the rehearsal might run just a tad long, but I know that I can’t afford to let every rehearsal activity run long. A digital clock off to the side of the podium has helped me to be more efficiently use my time in rehearsal. A big factor in ensemble success can be related to effective strategies for at home practice. That being said, there are a lot of related issues including how much practice, what to practice, and how to effectively practice so that good habits are reinforced and not errors. A general goal for all graduation high school musicians might be to become an individual learner, i.e. to teach yourself to further develop your musicianship skills. I have found over the years that many students need help in this process, including some in my collegiate feeder ensemble. As a result, it has been effective to demonstrate how to practice in rehearsal. Usually, this involves me guiding the ensemble on how to achieve a small section that has been giving us trouble in terms of rhythm or articulation. If one section, or student, can model what you are looking for take 15 seconds for all involved to practice that concept quickly. It will sound cacophonous as everyone practices at the same time, however, you will be able hear improvements. Model the section again, put it together, and move on. For groups that meet on a very limited schedule, this technique is very helpful. It is easy to get carried away in rehearsal with too much commentary from you, the director. Consider how much you talk in rehearsal in relation to how much the students are actively making music. Most student groups seem to love a break in rehearsal when the director lightens the mood with a personal story, observation, or an analogy related to the music at hand. When rehearsal time is limited, don’t monopolize your student’s learning time in rehearsal with too many of your favorite stories. Efficiency also suffers when there are too many distractions due to announcements, fundraising activities, and sometimes even appropriately asked student questions. When you are under a time crunch, or your rehearsal time is short to begin with, be sure to carefully plan for these distractions as much as possible. Announcements can be written on the board beforehand, posted on your website, or sent via Remind 101 or email. When you do have legitimate announcements that need to take place at rehearsal, try to put them at the end. Placing announcements at the end of rehearsal sets the tone that the music is the most important activity that we do together. It is important to take the time to reflect on your most recent rehearsal and to plan for subsequent rehearsals. There are a lot of things, however, that can get in the way. Administrative duties, meetings, email, and other job related stuff can and do get in the way of careful thought and effective planning for the next set of rehearsals. I realize now that this is a phenomenon that effects both public school and collegiate directors alike. All of us need to keep our focus where it matters most – making music! I am certain that there is no “one size fits all” solution to this problem, but here are a few things that have worked well for me: 1) As the ensemble is changing from one piece to the next, jot down a couple of notes in your rehearsal notebook to focus on for next time or make a small mark in your score. If this time is too short, do this during the passing period between classes or at the end of the day. 2) Keep the previous rehearsal(s) in your mind as much as possible as you go about your other duties. I prefer to get distracted with thoughts about ensemble rehearsal far more than thoughts about administrative duties and answering email. 3) Take the time to complete your plans for the next rehearsal at a convenient time – that evening after school, in the morning as you get prepared for the day, or during your planning period. 4) Video record portions of your rehearsal to help guide planning and to keep your subsequent rehearsals fresh. Nothing sets you up for success more than making appropriate and quality choices about performance literature. I believe that this is one of my most important roles as an ensemble director. There is a lot riding on these decisions about performance literature and I view it as my duty to serve the ensemble well by making wise and informed decisions. Rehearsal efficiency is directly tied to my programming choices and over-programming really bogs down this process. Search for literature that provides a good “fit” for the ensemble with enough variety and challenge to motivate, but not so much challenge that you end up bucking against the actual time that you have for preparation. One suggestion is to keep a list of possibilities that you listen to and reflect on from time to time before making a firm commitment for the next concert or concert series. My list has always included a collection of literature that I heard others play at festivals that I have attended or adjudicated, conversations with colleagues, widely used literature lists, and my own research and digging for new and / or time-tested sources. With younger ensembles and ensembles with limited rehearsal time, pay close attention to sight reading accuracy especially in terms of rhythm. This is a big deal and much more of a factor than I realized at the start of my career. Many experienced directors are happy to help younger directors select or suggest music literature, so don’t be afraid to ask. Think about your effectiveness in regard to your rehearsals, and no matter where you are on this journey, try to find techniques and strategies that help you to be more planned, focused, and productive. Distractions are inevitable, but carve out time to plan and prepare for effective rehearsals. Do this by assessing your strength areas and where there is room for growth. Rehearsal efficiency is certainly on the minds of those with limited time per week for rehearsal or for directors with a performance right around the corner. Perhaps, the tips outlined in this article can help. 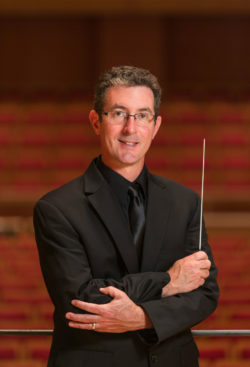 Dr. Ron Gerhardstein is an Assistant Professor of Music Education and Associate Director of Bands at Pacific Lutheran University. At PLU, he directs the University Concert Band; and teaches coursework in music education, instrumental methods, and supervises student teachers. Duke, Robert A. Intelligent Music Teaching: Essays on the Core Principles of Effective Instruction. Center for Music Learning; Austin, TX (2011), pg. 116. 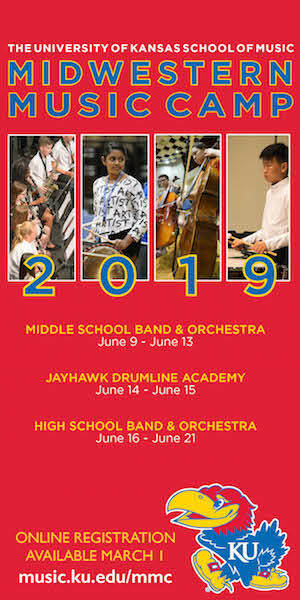 The Kansas Music Review is the official publication of the Kansas Music Educators Association, a federated State Association of the National Association for Music Education.